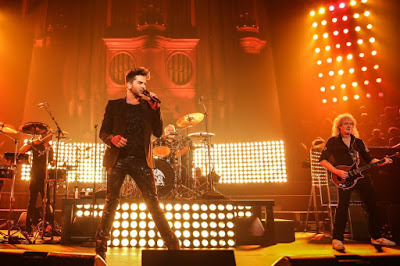 Queen bridged 2014 into 2015 when they were joined by Adam Lambert for a New Year’s Eve concert in London to ring in the New Year. The event at Central Hall Westminster – close to the iconic landmark of Big Ben – saw just 2000 fans on hand for the intimate live show which was broadcast on BBC One and streamed globally via BBC online. The pairing launched a European tour in Newcastle, England on January 13; the 6-week run wrapped up in Switzerland in late February. In March, the group’s iconic 1975 classic, “Bohemian Rhapsody”, was voted the UK's favorite song from the 1970s in a poll for the ITV broadcast specialThe Nation’s Favourite 70s Number One. Roger Taylor’s son Rufus made headlines in May when he was named the new drummer for UK rockers The Darkness following a lineup change in that outfit. In mid-July, Queen revealed that they would release “The Studio Collection” Special Edition Vinyl Box Set in September. The package presents 18 remastered vinyl editions of the complete collection of 15 Queen studio albums – from the 1973 self-titled debut to 1995’s “Made In Heaven” - and comes with a fully customized limited edition Queen-branded turntable made by Rega. On September 18 as part of a fall South American tour, Queen and Lambert headlined the opening night of the 30th anniversary of the Rock In Rio festival in Brazil, marking the band’s return after opening the inaugural event in 1985 with original lead singer Freddie Mercury. Queen and Lambert will launch a 2016 summer festival run at Rock In Rio in Lisbon, Portugal on May 20.